Crisis: Mexican, Latin American, Latino and Chicano Art. The Sociological Imagination. Miranda takes us to present-day México. His work focuses on violence which occurs daily in Mexico , and is part of every other society in the postmodern age. In addition, Miranda´s art includes of a gas mask worm by individuals throughout his work. The crisis created by smog and pollution is a daily occurrence in Mexico and in all industri-alized societies. Many people throughout the world will die of cancer and leukemia directly (and indirectly) related to impurities in the air we breathe. Their illnesses and deaths are part of the crisis in health which is inescapable. Potsdamerplatz. 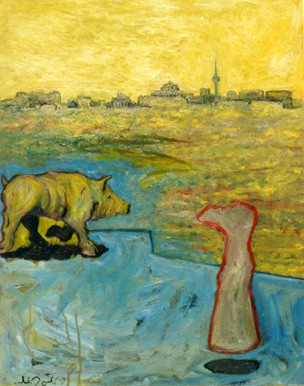 Óleo / Tela. Öl / Leinwand. Oil / Canvas. 90 x 70 cm. 1990. Berlín.